This book addresses a gap in the present literature on the role that geography plays in the distribution of entrepreneurial activity. Emerging work on entrepreneurial ecosystems suggests it is important entrepreneurship studies move beyond the mere identification of factors that impact entrepreneurial activity to consider the unique geographic contexts in which entrepreneurs operate. These contexts include a variety of interactive elements including regional characteristics, institutions, actors, and connectors. As such, this collection analyses entrepreneurial activity in regions around the globe. The contributions explore a series of diverse regions in terms of their geographic, historical, industrial, and institutional contexts. The book also explores a range of topics, such as patterns of regional/subnational variations in entrepreneurial activity, geographically mediated determinants of entrepreneurship, inter-temporal dynamics, evolution of regional systems of entrepreneurship, and the impact of entrepreneurship on regional development and regional entrepreneurship policy. 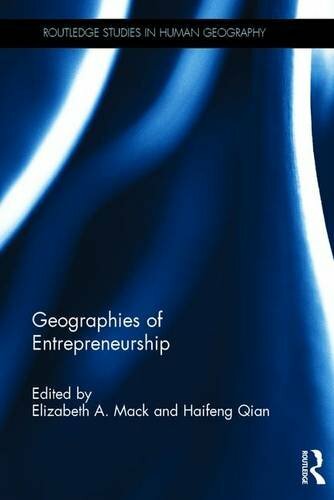 This book enhances our policy and practical knowledge about the unique regional context in which entrepreneurs operate and demonstrates the important role that geography plays in the spatial distribution of entrepreneurial activity. About: This book addresses a gap in the present literature on the role that geography plays in the distribution of entrepreneurial activity.